The HP 1650A logic analyzer I was given a few years ago has been a huge help with my hardware hacking. I was talking to Nemo the other day and he has a Selae Logic Analyzer (I'm envious). His came with E-Z Logic clips that look identical to the HP/Agilent branded clips I got. Going rate is over $1 for the HPs and almost $3 for the E-Zs. Instead, get yourself some cheap SMD clips from eBay, about $0.50 each. Also, get a right-angle 0.1" header. Pull pins out of the header, one for each clip. Disassembling the budget clips reveals a convenient hole into which the pin can be soldered. In fact, the hole is a sort of rivet. 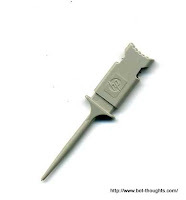 You want to carefully solder the pin to the rivet itself so it can rotate. Once you've got the pin soldered in, trim down the soldered end of the pin (you can see it sticking out in the picture below). Then, reassemble, and now you have a place to plug in your female analyzer lead. Thanks for the tip, Nemo!